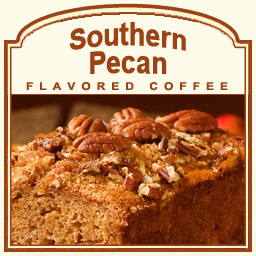 Indulge in a Southernly-sweet coffee with the special Southern Pecan flavored coffee. A mix of buttery pecans with a subtle roasted undertone, this 100% Arabica bean gourmet coffee will satisfy any coffee lover with its delicious and warm flavoring. Instead of worrying about the calories in a slice of pecan pie or a bowl of pecan-topped vanilla ice cream, you can indulge your taste buds in our version of a decadent treat. With only 2 calories, this Southern Pecan coffee will remind you of your favorite pecan recipes. Whether you like this flavored coffee hot or cold, the Southern Pecan flavored coffee will become a favorite. Roasted and shipped on the same day, this Southern Pecan flavored coffee will be fresh and subtly sweet. Packaged in a heat-sealed valve bag, your taste buds will love the fresh taste of the South!